Rose City Yarn Crawl Mystery Knit-a-longs (Clue 1 and 2) | Curiousity? As I mentioned in my post about knit-a-longs, the Rose City Yarn Crawl runs both a knit and crochet a long in the month leading up to the yarn crawl. It’s a real treat seeing people wear their creations out on the crawl, and I wanted to be one of those gals sporting a new finished object on the crawl this year. Okay, so it’s actually blue-white-red like the French flag, but I am Canadian after all! 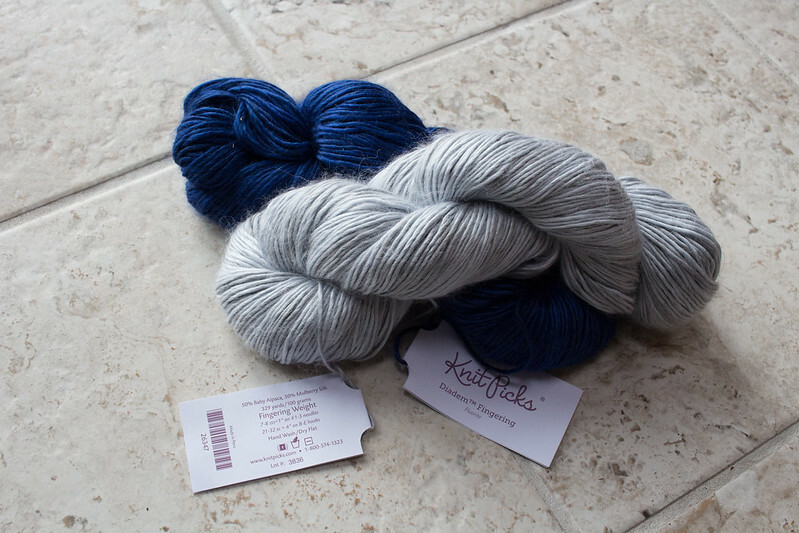 This is KnitPicks Diadem yarn, bought during the big yarn sale in November two years ago on spec, because it sounded lovely and I wanted to try it. It’s a super fluffy alpaca-silk single ply that *feels* like heaven, but it’s kind of hard to work with because it sheds fluff, splits, and the fluff felts into little loops around the yarn that I have to cut off pretty frequently plus it sometimes loops around to make knots. And it’s hard to photograph because of the halo of fluff. 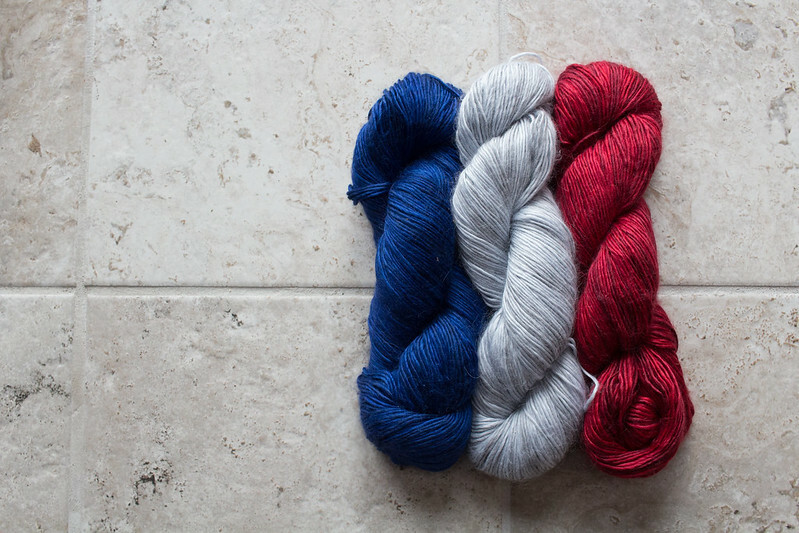 I was initially pretty disappointed by the yarn, but as I’ve gotten used to it, the luxurious feel balances out the finicky nature of the yarn. 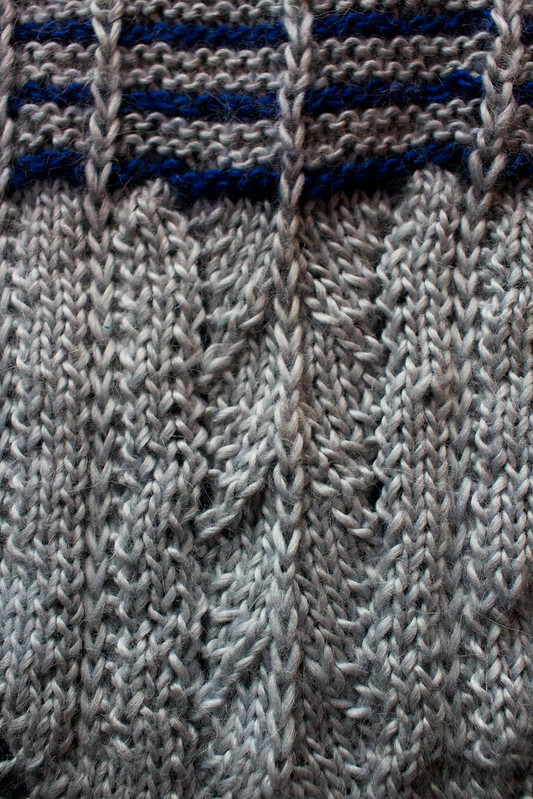 This is going to be one luxurious cowl, although I’m going to have to work for it! Clue 1 is supposed to remind you of bike treads. I think it does! The whole pattern is written like a story about a bike ride, with twists and turns. Clue 2 involves some scenery and then some winding roads. It was at this point that realized that I’d somehow chosen my high school colours, silver and blue, because it reminded me of an old high school shirt when I started to get into the “scenery” part. Oh well, they’re great colours even if it is a bit funny. Now let’s zoom out and see clue 1 and most of clue 2. I needed to take the picture while I still had nice light and figured you’ll see the last part next time. Clue 3 has been out since Wednesday so I’m a bit behind! That… does not look like a cowl at all, to be honest. What a strange beast! I look forwards to seeing how this construction is going to work in the end. Overall, the story of this cowl kind of makes it fun, and I’m loving how it feels even if the knitting process can be a tad annoying thanks to finicky yarn. 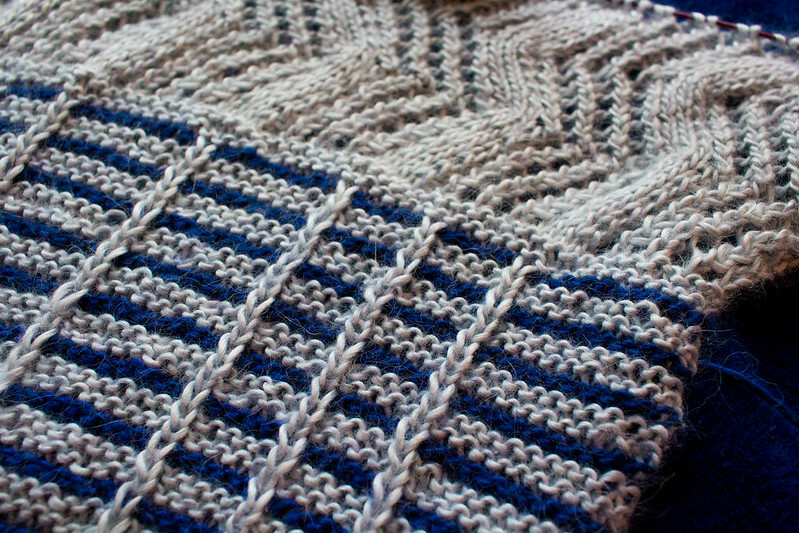 I do think I’m done with mystery knits for a while after this, though… after seeing how beautiful other people’s cowls look with colour two as a variegated, I have a deeper understanding of how much I like selecting colours with advance knowledge of how they’re going to work together. But I did choose something high-contrast which looks pretty good, so I can’t be too sad! 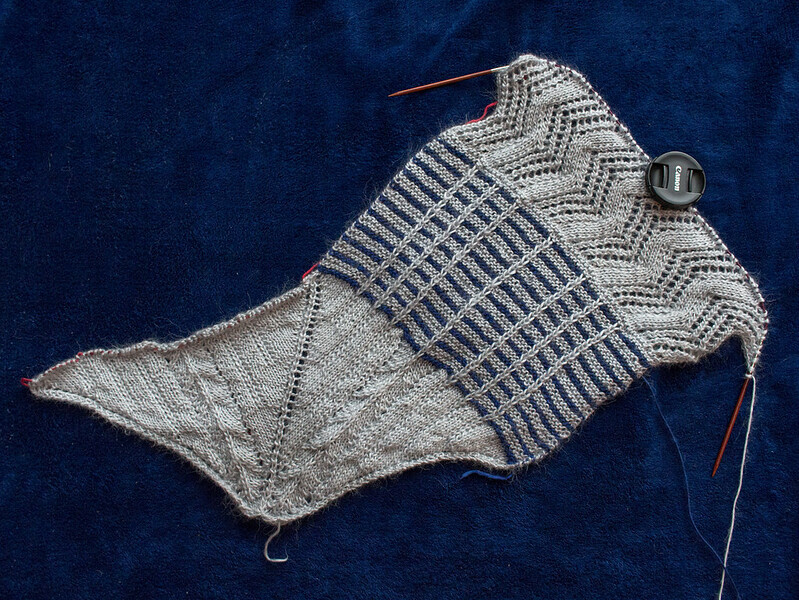 This entry was posted in knitting, wearable, work in progress, yarn. Bookmark the permalink.